Epson's Home Cinema 5050UB ($2999 on Amazon) Pro-UHD HDR projector has arrived! It's been three years since Epson debuted the popular and highly regarded Home Cinema 5040UB. The 5050UB is a dream machine for cinema lovers, it's designed to easily fit into most small and medium-size home theaters and deliver stunning image quality, especially when considering the price. 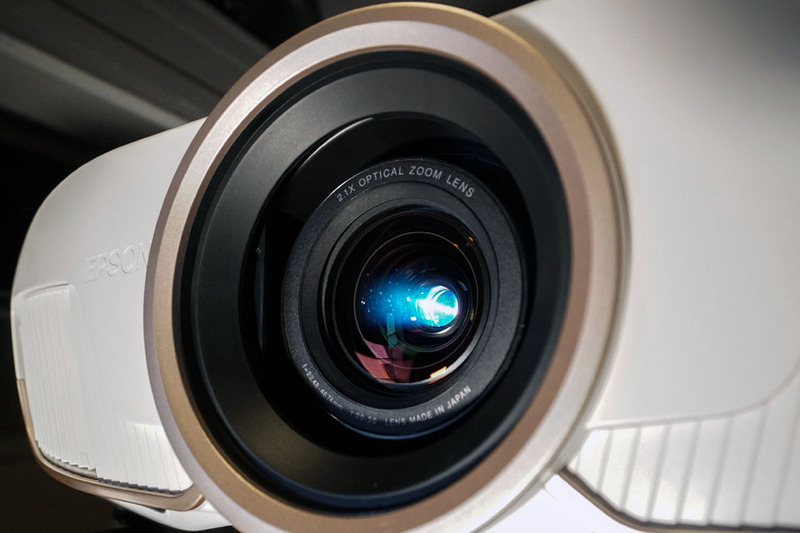 While there is a small bump in spec'd peak lumens (2600 versus 2500), the main upgrade in performance offered by the 5050UB is centered around the Pro-UHD technology, a refinement of the various image processing and resolution enhancement technologies employed by Epson in these 3-chip LCD projectors. For those wondering, the the 5050UB will not replicate a checkerboard single-pixel 4K test pattern. Technically the projector is putting just over 4 million pixels on the screen (2X HD, but only ½ UHD), because the imaging chip shifts between two position to offer enhanced detail. You can also turn off the 4K enhancement and directly observe the difference it makes—there's more detail and furthermore, it eliminates the "screen door effect" that's visible when 4K enhancement is turned off. In other words, leave it on. Full-bandwidth HDMI 2.0 (18GHz) allows for 4K/60 playback, which is great for streaming 4K and gaming. The Home Cinema 5050UBe comes equipped with a Epson WirelessHD transmitter with 4K/30 support and four inputs. This review is of the wired 5050UB. Also, this projector has one HDMI input that's explicitly for optical HDMI that provides power to the cable. Epson equipped the 5050UB with its high-performance and flexible powered lens. This allows 47% horizontal-axis adjustment and 96% vertical axis adjustment. Furthermore, the 15-element, 2.1X zoom lens features "zero light leakage" that contributes to the UltraBlack performance of this unit. The behavior of the different picture modes of the 5050UB will not come as a huge surprise to Epson fans. Cinema and Digital Cinema provide true 100% P3 gamut coverage and a very accurate, neutral presentation, with Medium power being highly color accurate out the box (to use High power mode requires a calibration for color accuracy). Natural and Bright Cinema also exhibited good color and add a lot of extra lumens to the mix—more than double the previous two modes. Meanwhile, Dynamic mode is where you'll find the spec'd peak lumen output. In Dynamic mode I was able to verify Epson's million-to-one dynamic contrast claim; yes it depends on dividing peak output by the all-black screen that comes courtesy of the dynamic iris. Dynamic contrast was not as high in other modes, but Cinema delivered a 150,000:1 reading. Native contrast, measured with the iris turned off, is considerably lower but still good enough to put a punchy picture on screen. I measured 6200:1 in Cinema Mode medium power and 8000:1 in Dynamic mode. The lowest native contrast measured was 5600:1 in Cinema Bright; this is about the same native contrast as modern LED-lit FALD VA LCD TVs achieve (viewed on-axis). I recently watched Bumblebee in UHD, streaming from Vudu, using the Cinema Mode and Medium power on the 2.40:1 StudioTek 130 (1.3 gain). However, since the movie is 16:9 aspect, I used the lens memory feature to zoom out and accommodate that. One benefit is it made the default Cinema Mode peak highlights bright enough to give 'em a bit of twinkle. While it did not have "HDR-like" highlights, every moment of every scene was unbelievably clean—no signs of artifacts or banding whatsoever. Colors were very rich and the details were as distinct as I'm used to seeing from 4K. The main thing here is that even when fairly close to the screen (10 feet or so from the 96" diagonal-equivalent 16:9 screen), I can't make out individual pixels on the 5500UB, ergo you are seeing about as much detail as you are going to see. Anyhow, I say all that because I was impressed by the final product of the 5050UB, what it put up on screen does true justice to UHD movies. Epson had suggested I check out The Greatest Showman, citing it as a great example of how this projector can handle color, contrast and motion. I own it, and I agree it's an exceptionally well produced (and entertaining) film... although if you are not a fan of musicals you might not agree. Anyhow, there's little more colorful than The Circus and the choreographed dance scenes were rendered with cinematic cadence and very clear motion. I also has a chance to watch a couple of Sixers games streaming in 1080p on YouTube TV. It looked extremely good with the lights out, like a 96" TV was hanging on the wall... but a 96" TV with perfect uniformity and no off-axis viewing issues. It's glorious, and I can't with to try the same on my 110" ambient light rejecting screen. I will be calibrating the Epson Pro Cinema 5050UB upon return from a 4-day trip and getting into using it with the Seymour-Screen Excellence Ambient Visionaire Black (0.9 gain) wide viewing angle ambient light rejecting screen. There are clearly plenty of lumens available to make the jump from 1.3-gain to 0.9 gain and filling a 119" diagonal screen with both SDR and HDR imagery that pops. I expect to see over 100 nits in Natural, Medium Power and should even be able to eke out a DCI compliant 46 nits from Cinema Mode Medium, which is this projectors least bright mode but in reality it's very useful to be able to "dim" the projector to 46 nits, which is the DCI standard for non-HDR films. Add to that the wide color gamut and high bitrate of UHD content and what's on screen looks like it's playing in one of those premium commercial cinema auditoriums. I'm optimistic this projector will offer even greater performance once it's fully calibrated. So stay tuned for all that and more, coming next week. Alaric, MidnightWatcher, tenthplanet and 5 others like this. Last edited by imagic; 04-15-2019 at 09:02 AM. Has there been a confirmed release date yet? Months of waiting and anticipation and finally it is upon us! I assume that coming from a Benq W1080ST paired with a 125" 16x9 screen and going to the Epson 5050UB and 158" 2.35:1 screen will completely alter my life and reality as I know it. LowellG, tenthplanet and ckronengold like this. Any comments on fan noise? My PJ sits right above my head. You'll find fan noise in medium and eco modes to be very pleasant. The massive size of the projector gives it a very hushed and consistent noise profile. However, on High mode, the fan noise is a magnitude noisier. When viewing loud amterial it is not objectionable but when the scene quiets down I can definitely hear it. Luckily the profile of the fan is still consisted and "whooshy". No whines and rattles. Alaric and tenthplanet like this. This here is an accurate take on the fan noise, thx! Man - I was ready to roll with a JVC NX5 or NX7 but the bang for the buck of this Epson has me reconsidering. Especially for the price difference. I'm 75% sports and gaming so this would fit the bill. Anybody have any experience regarding how much more blacker the blacks would be on one of the JVCs compared to this Epson. Would be in a room with darker walls, light ceiling, minimal ambient light (from the steps down to the basement). I need to stress that with most content, the fact this is a pixel-shifter and not a full UHD projector is practically irrelevant. Your comment quoted above IS relevant. I am also testing the 5050UB and I agree with most every point in this review. This is a fantastic projector but I wish notable reviewers would stop giving 1080x2 e-shift a pass and put some pressure on the leading consumer projector manufacturer. It's ok to critique one of the only drawbacks on what will undoubtedly will be one of the most popular projectors this year. The review acknowledges that 1080x2 e-shift is markedly better than 1080p content as a baseline. Agreed. But saying that "this not being a full UHD projector is practically irrelevant" discredits the review's comments about how much better the 4K Enhancement looks compared to off. 1080 is to 4Ke as 4Ke is to full UHD. Having 8.3M pixels on screen vs 4.15M pixels on screen IS relevant... if not for the deeper color space, what else is the push for 4K for? Especially for our massive projector screens? The fact that this does 1080x2 is totally fine by the way. It's a great picture all things considered. My point here is that yes, PQ has so much more than just resolution... but with hat said, knocking it for not producing 8.3M discrete pixels is not a bad thing in an objective review. Context: I am also testing the Epson 5050UB and went into this Epson with several assurances from folks "you won't notice in normal viewing". Sitting from 16 feet on my 160" 16:9 screen, I can absolutely notice the difference in resolution comparing this Epson to a sharp 1080x4 shifter. stef2 and sage11x like this. Last edited by scottyroo; 04-08-2019 at 10:41 AM. you comment quoted above IS relevant. I am also testing the 5050UB and I agree with most every point in this review. This is a fantastic projector but I wish notable reviewers would stop giving 1080x2 e-shift a pass and put some pressure on the leading consumer projector manufacturer. It's ok to critique one of the only drawbacks on what will undoubtedly will be one of the most popular projectors this year. The review acknowledges that 1080x2 e-shift is markedly better than 1080p content as a baseline. Agreed. But saying that "this not being a full UHD projector is practically irrelevant" discredits the review's comments about how much better the 4K Enhancement looks compared to off. 1080 is to 4Ke as 4Ke is to full UHD. Having 8.3M pixels on screen vs 4.15M pixels on screen IS relevant... if not for the deeper color space, what else is the push for 4K for? Especially for our massive projector screens? But the reality is that most content is not 4K!!! That's really the point I was making, you can watch a regular Blu-ray on this thing, get everything you can out of it in terms of color and detail, and not have to suffer screen door effect. I have a native 4K projector so I am using that to make these subjective observations. You are sitting fairly close for a screen that size, you are in the zone where it's possible to see more detail with 4K. Well, at least when the projector is paused. Add motion to the equation and the gap in detail rendition shrinks. tenthplanet and sage11x like this. Last edited by imagic; 04-08-2019 at 09:53 AM. I have a dumb question, I am days away from putting up the first wall in my basement/theater build. I plan to place the projector high up on a shelf inside a media closet projecting through a cutout about the size of the projector to prevent ceiling mounting and fan noise. It will be around 20' away from the screen if that matters. Is it possible to place a pane of glass over the hole in the wall without the projected image getting effected? If I could cover that cutout I'm sure I could reduce sound even more. I'm so excited to get the 5050 in the coming months! … You are sitting fairly close for a screen that size, you are in the zone where it's possible to see more detail with 4K. Well, at least when the projector is paused. Add motion to the equation and the gap in detail rendition shrinks. Sitting 16' from a 160" screen produces the same FOV as 10' from a 100" screen, which is very mainstream these days according to every recent poll taken on AVS Forum about screen sizes and viewing distances, with many preferring even closer/larger. One factor that influences perceived differences in sharpness between 2x and 4x pixel shifters is when the 2x shifter is 3LCD and the 4x shifter is DLP. It's always been accepted that DLP generally appears sharper than 3LCD because DLP doesn't have 3 image panels that need to be in perfect alignment for maximum perceived sharpness. Even with 1080p vs. 1080p many prefer the "look" of DLP to 3LCD, so this could influence someone's perception of 2x 3LCD vs. 4x DLP pixel shifters. Anyway, there is certainly a difference in opinion about the relative sharpness of 2x 3LCD vs. 4x DLP. It seems that no matter how a professional reviewer describes this difference there will be disagreement among forum members about how that difference was stated. WynsWrld98, Alaric, tenthplanet and 1 others like this. I am well past the point where I'm going to sweat semantics for a subjective sentiment such as that. Robert Clark, Alaric and tenthplanet like this. I think you are right... Your "full UHD not relevant" sentiment makes sense based on the context that most content is not 4K. My concern (not with you, just most reviewers of these 1080x2 shifters) is that an assumption is being made on behalf of the readers that the majority of content they will consume is not 4K. As a not so unique example, every input source I run is 4K (Shield TV, Xbox One X, Sony x700). In addition, >80% of the content I watch these days is 4K HDR. The result of my concern is that some readers will experience exactly what happened to me when they go hands on with the Epson 5050. My experience was this: I have read from pretty much every outlet reviewing the 4010 and 5040 that "you can't tell". When I, in fact, could tell the difference to a full UHD projector, it was a little bit of a let down. You are also correct that when motion is going on it is hard to tell but the same could be said for native 1080p vs native 4k when motion is on the screen. Motion always makes it better. But that, IMHO, is giving the tech a pass since most people are in the market for 4K and will be viewing 4K in varying ways. At the end of the day, my point is this: I wish projector reviewers would start referencing resolution performance relative to their 4K capabilities that they are marketing and not giving them a pass if they fall somewhere in the middle ground between 1080p and 4K. An example of how to do this.... I would recommend qualifying the "not relevant" statement with the additional context you provided about the amount of 4K content people view. Maybe the sentence (or overall sentiment) should read as, "the fact this is a pixel-shifter and not a full UHD projector is practically irrelevant [since most content is not 4K]!" Re: my seating distance, I also don't think I am sitting too close. 16' is actually my second row and I fully enjoy my front row at 11' for certain content. Long story short is I went through an exhaustive process to find my ideal seating distance when building my theater. This included laser measurers and an empty matinee showtime at my local theater. Getting to the point, I think more and more people are gravitating towards the THX recommended viewing distance of screen width/.84. I know that is what I prefer. That seating distance recommendation would get me to a seating distance of 13'10". The reason my second row (most used) seating distance is 16' is because I didn't want there to be a bad seat in the house so I split the difference and did my over the top tests at the movie theater to confirm the front row would be ok seating distance-wise. Alright! I'm done! This is me just getting out all my feelings I've had on the 1080x2 reviews so don't take it personal. haha Keep up the good work and can't wait for the full review when you are back in town. WynsWrld98 and stef2 like this. Mark, I'm anxiously awaiting this one. I'm glad the Scottyroo brought this up, because by reading your review, I didn't pick up that your caveat was based on non-4K material....the reason being is that 90% of the content I watch IS at least 4K, if not HDR. So would it be accurate to say that if I'm looking for a 4K projector for watching 4K, HDR content, that I might want to look elsewhere? I’m sure you’d appreciate multiple data points. I’m interested what Mark thinks with that context as well. My answer to that based on my 20+ hours with the 5050 is that you shouldn’t base your decision to look elsewhere based on the resolution alone. The image really is fantastic and combined with good brightness, input, and contrast it should definitely be toward the top of the list for people in this price range with the caveat that it isn’t as sharp and doesn’t have the resolution that some other DLPs have in this price range. But that begs a whole new discussion about the trade offs going that route I won’t get into here. The resolution and HDR mode not auto engaging are the top two things I would want changed on this projector. The mode change could be changed with firmware so hopefully Epson does that on the 5050. WynsWrld98, Robert Clark and jpolachak like this. What one sees and how they feel about it are quite subjective. Given the 96" size of his screen, it's likely not going to be as much of an issue than someone with a 150" or greater screen size, ergo, it will be "practically irrelevant" for them. All things considered (from recommended seating distances), I'd say that 1080x2 will be quite acceptable for 120" and smaller screens, whereas those with screens larger than that will begin to notice the lack of a full 8.3 million pixels on screen. Even then, however, not all of them will consider this a deal-breaker when the value proposition is as high as it is with the 5050UB. Last edited by MidnightWatcher; 04-08-2019 at 12:58 PM. Review seems pretty similar to the 5040 review - great picture, great value. Queue the thousands of "will the 5050 be a worthwhile upgrade from my current projector?" posts. Epson's Home Cinema 5050UB ($2999) Pro-UHD HDR projector has arrived! It's been three years since Epson debuted the popular and highly regarded Home Cinema 5040UB. The 5050UB is a dream machine for cinema lovers, it's designed to easily fit into most small and medium-size home theaters and deliver stunning image quality, especially when considering the price. For those wondering, the the 5050UB will not replicate a checkerboard single-pixel 4K test pattern. Technically the projector is putting just over 4 million pixels on the screen (2X HD, but&#160; only &#189; UHD), because the imaging chip shifts between two position to offer enhanced detail. You can also turn off the 4K enhancement and directly observe the difference it makes—there's more detail and furthermore, it eliminates the "screen door effect" that's visible when 4K enhancement is turned off. In other words, leave it on. While native 4K is great, and home theaters offer an opportunity to sit close enough to the screen where you will&#160;see the extra detail when it is present, I need to stress that with most content, the fact this is a pixel-shifter and not a full UHD projector is practically irrelevant. Most of what you want out of 4K HDR content, like DCI/P3 color, smooth gradations and well rendered details during busy action scenes, comes through thanks to higher&#160;bitrates. Pixel count is not the only determining factor for picture quality when you watch a movie, being able to ingest UHD is key to how great the image put out by this projector looks. I'm optimistic this projector will offer even greater performance once it's fully calibrated.&#160; So stay tuned for all that and more, coming next week. Hi I magic, would you be able to test input lag @ 1080p 120hz. I'm looking for a projector with great contrast and low input lag for PC gaming on a large screen. In addition, would the response time be acceptable compared to a lcd. I currently own a vizio pq65 but would like a larger screen without paying upwards of 7 to 8,000 dollars. I've never owned a projector so forgive my ignorance. THIS. Yes I agree 100%. Even with a 160" screen the value prop of the 5050ub is good. It isn't a deal breaker. Mark was coming from the context of low 4K content and small screen. My situation is the inverse on both points. Big screen. Lots of 4K content. So my point isn't with the tech itself, that horse has been beaten enough already. I guess when boiled down, I'm just frustrated the last few days that my expectations of resolution clarity weren't met. Those expectations were based on the countless reviews I've read of the 5040ub/4010 saying that the 4Ke is really good and you can't tell. WynsWrld98 and MidnightWatcher like this. The 5050 thread is saying April 9th. In short, yes, you can use glass to fully isolate the projector from the theater room. I recommend Edmund Optics AR high efficiency glass, either the 1mm or 3mm thick glass. It is expensive but not prohibitively expensive and will not affect your image. You should place it at an angle from the lens so it doesn't reflect back any light onto the lens and cause problems (even though it is antireflective, it will reflect some light backward). However, keep in mind the Epson has both the intake and exhaust vents at the front of the projector, so you will need to make sure you have clear pathways for air to get in and out of those vents, and to make sure that the hot air has somewhere to go. Finally, the screen size will determine your min and max throw for positioning the projector. For a 120" 16:9 screen, 20' will work, but the further you go back from the minimum throw, the more light you lose. You can pick up some extra nits if you put the projector at the minimum throw distance, and for HDR every nit counts. I would either talk to a dealer about your screen size and throw distance before purchase, or use one of the online calculators that will calculate both the throw ratio and the amount of impact it has on the brightness of the image before making any final decisions. 20' is nearing the longest throw for a 120", and you couldn't go much smaller than 110" at that length. The Epson 5050UB is going to have the fastest input lag of any projector that can display more than 2 million pixels and accept a 4K input. However, this projector does not support 1080p at 120hz. At 1080p 60hz the input lag I measured is 26ms. If you are looking for a full 4K UHD 8.3M discrete pixel projector, the BenQ TK800M has the fastest input lag among those projectors. I measured 42ms. At 4k60hz in HDR expect 42ms. I have tested 1080p120hz and the higher refresh rate shaves 8ms off the draw time. So 34ms. If you are looking for a 1080p only projector that can do 120hz, look at the BenQ HT2150ST, 2050a, or TH671ST. All of those project at a relatively low throw ratio and have 8ms input lag at 1080p120hz and 16ms input lag at 108060hz. If you are looking for a 1080p projector capable of accepting a 4k HDR signal but still projecting a 1080p signal (can also do HDR), the Optoma HD27HDR has 8ms input lag at 1080p120hz and 16ms input lag at 108060hz. Re: you question on whether or not it would be acceptable compared to an LCD, it totally depends. The PQ65 has measured input lag of 15ms. You would be hard pressed to tell a difference between the Vizio and the Epson 5050 at 26ms. The TK800M you may feel a difference but the TK800M is still very fast as far as 4K projectors go. Last edited by scottyroo; 04-08-2019 at 01:52 PM. In that price range, you might want to consider JVC X790R/RS540. With street price now under $4k, it costs only slightly more than the $3k 5050UB, but has a much better contrast and black level than pretty much anything else. Even the NX5 doesn't come close, although with NX5 you get native 4K resolution. Yes you can use glass to cover the cutout, but you'd need some high quality glass (preferably with anti-reflection coatings) to reduce reflection and optical and chromatic distortion. However, you have to remember that your PJ needs adequate ventilation and failure to do this will have dire consequences. Sensor shift, not lens shift, fwiw. "Real" 4K is native 4K which none of the pixel-shifters are, FWIW. How does this Epson compare to the Sony VPL-vw695es? I was planning to go with this Sony projector, but it retails for 4x the price ($12,999 US) compared to this Epson. I am not sure what the Sony offers for its huge price premium aside from True 4K performance, which seems to be marginally discernible when compared to the Epson's sensor shift technology. Furthermore, the Sony is only 1800 lumens, compared to 2600 lumens for this Epson! Sony lists dynamic contrast 350,000:1 but Epson lists 1 million:1 (not sure how the Sony real world values compare to what Mark measured with this Epson). Both have lens memory. The Epson sounds like a great projector. What does the Sony offer that the Epson cannot match? Last edited by blake; 04-08-2019 at 04:43 PM. Comparing how much fine detail one will see on two different size screens is only relevant when the exact viewing distance for each screen size is factored in. Screen size divided by viewing distance defines field of view. Those sitting 15' from a 150" screen will be no more likely to notice the lack of a full 8.3 million pixels on screen than those sitting 12' from a 120" screen because they will have the same FOV -- 39.9 degrees, to be exact. Beyond that it certainly does become quite subjective about how anyone may feel about it as evidenced by the daily back and forth on this forum. I saw that it was 4 grand on Best Buy. Wonder how it’s black level and contrast compare to nx7? Time to do some 540 vs nx7 comparison googling tonight I suppose. Part of me just wants to get the nx7 or 695 and skip any chance of buyers remorse. Ok. So the big question is? 3550 or 5550 or 5050? Also, is it worth, on PQ alone, to get a 5040 or 5050? Taking the 4k60 out of it. Saw a new Epson 4050 listed on Ebay. Does anyone know how the 4050 differs from the 5050? 25 Attachment(s) Go to first new post Can someone build me an enclosure? 460 Attachment(s) Go to first new post Oppo to stop production? This is not a joke.